If you ride with any kind of frequency, you have a sizable collection of bike “stuff”. Clothing, shoes, parts, bags, trophies (you know, if you’re a big shot singlespeed Crank the Kanc podium finisher), cowbells, this, that, who knows what and how many. 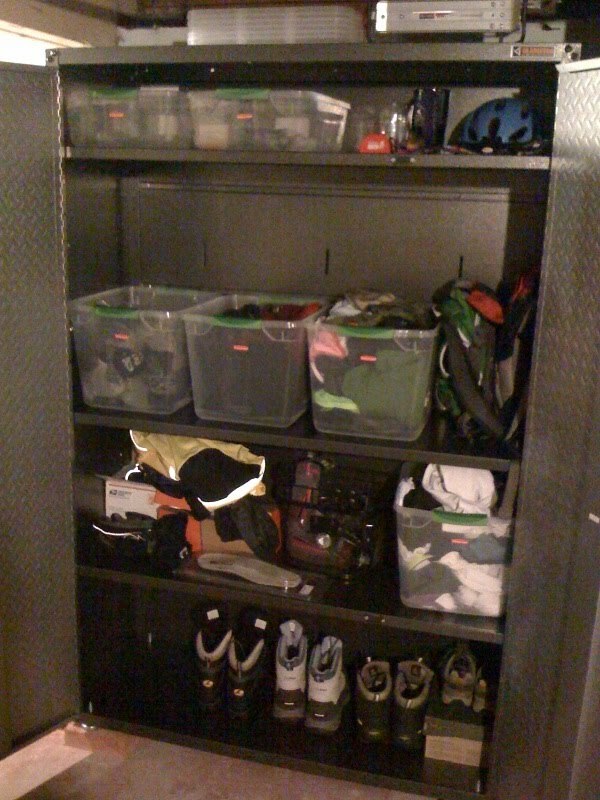 At least in our house, bike stuff tends to accumulate everywhere it can in epidemic fashion. In a closet, upstairs in a basket, maybe in a bin in the car, in the dining room, on the porch, a little here on a desk, maybe some more hiding out quietly in a corner. Nothing is ever together. Consequently, I rarely know about everything I have. As such, I spend a lot of time rummaging, I lose track of things, and sometimes buy things I know I already have but can’t find. What could possibly solve this problem…Kristen had what I now accept as a brilliant idea. 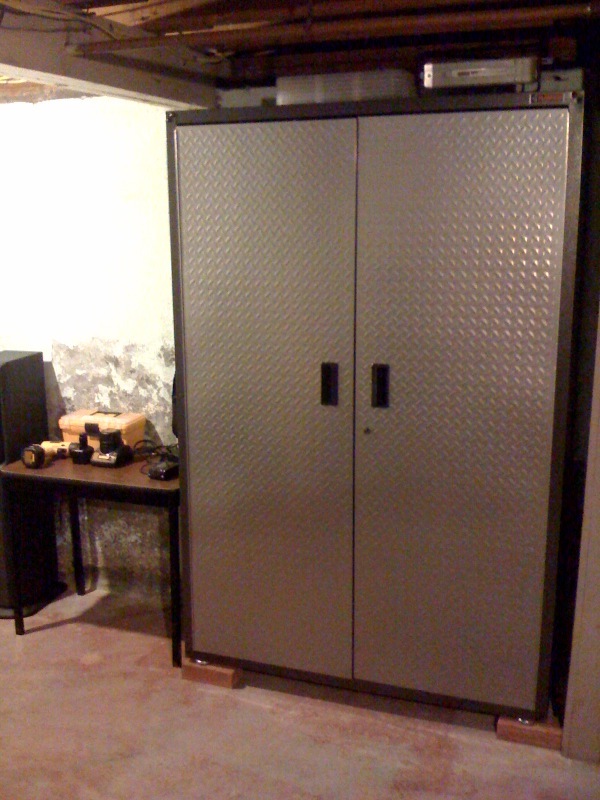 We picked up (barely) this Gladiator garage cabinet from Lowe’s. The idea was all hers, so I will take no credit. It is fantastic. We shopped everywhere for something like this, but this was the largest (48″ wide) and most useful, not to mention in stock. Amazingly, in packaging, the whole thing fits lengthwise in a Civic with the seats down. And not much sticking out of the trunk. I was very resistant at first, based on the cost – $348. But the net result is basically the addition of a entire closet to our house. A closet devoted to nothing but my crap. Took about 2ish hours to bolt the thing together, and it went together fairly easily. Having two sets of hands makes all the difference. We tracked down some Rubbermaid containers that fit the depth of the shelves perfectly, and now items can go directly from the laundry to a respective bin, where they won’t be lost. Kristen also had me toss a few cedar blocks in the bins in the best interests of the woolens. Full of good ideas these women are.